Two years and nine months after moving in, today I can declare the kitchen pretty much finished. There was nothing wrong with the kitchen when we moved in. 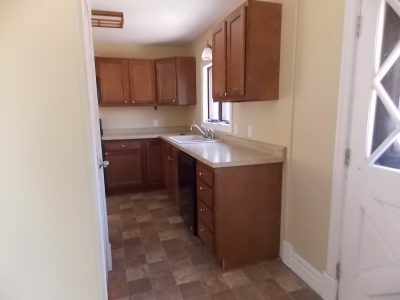 New appliances, neutral color scheme, pretty easy to just move right in. This is our first completely documented project that we’ve done and finished here at our Little House on the Hill. 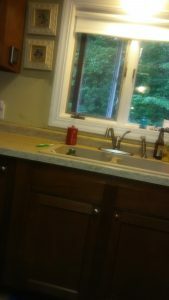 The sink was a composite material in an oatmeal color, the window window originally had brown wood still around the glass (you can see a glimpse in the photo on the left). 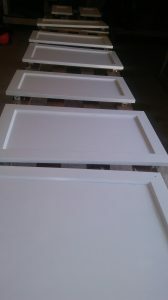 So I started out by priming all the cabinets, we removed all the doors and drawers and worked on them separately. 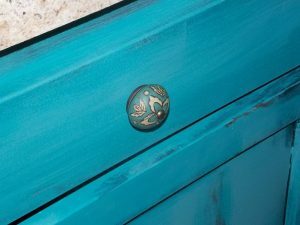 We decided on a white for the top and the bottom was made up by mixing together a few different colors and doing various washes of teals, turquoises, coppers and browns. 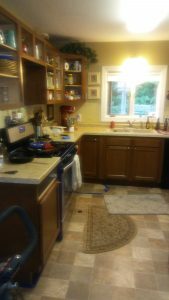 The countertops also needed to be replaced. The stove was installed too low in comparison to the height of the countertops, so the heat caused the glue to become undone and slowly a large bubble formed in the countertop. Eventually it spread throughout and I had to take a razor blade to it and slice it, then tape it all over with shipping tape. This was our makeshift solution until we were able to replace them. We were careful around the taped areas and surprisingly it held for about a year. We also changed out the kitchen light, we were fortunate enough that my dad was getting rid of a couple lighting fixtures and they both fit perfectly in our kitchen and dining areas. So we got rid of the boxed lighting. Here Bruce is starting to frame in above the cabinets to fill in the open space and give them the illusion of being taller. By doing this it’ll give the cabinets less of a choppy feeling, with blocks of color visually. This is a small kitchen and by having less blocks of colors it’s a little easier on the eyes. 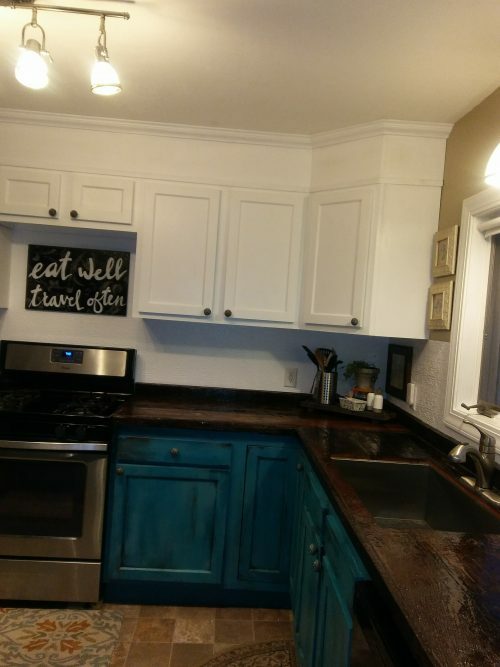 Both the white backsplash, white cabinets and now white uppers all help this. We used St. Croix Valley barnwood from across the river south of Scandia, Minnesota. These boards were amazing. Full of nail holes, knots and charm. To prep them we used a wire brush to clean them up a bit. Then cut them to size and connected them with cross-boards on the back and glue. Trim was added to the front along with a back piece of trim as well. The wall had a curve in it so this also allowed us some flexibility to deal with that in a subtle way by thickening up that back trim piece in places. On the back of the counters I taped off all the holes and then from the front used silicone to fill in the holes slightly. 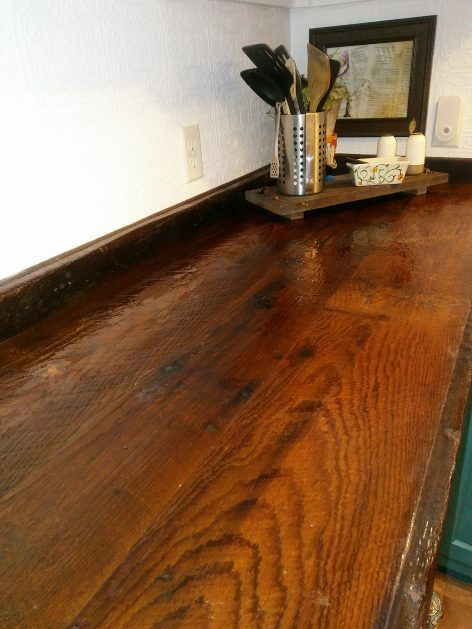 Then I used 2 part epoxy resin as a sealer. This helped level out places, fill in holes and also show off the amazing wood. 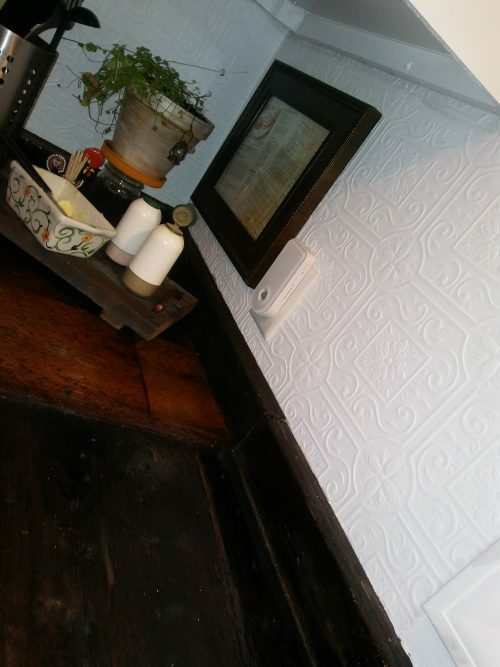 We had in our mind during the last two years that we’d subway tile the backsplash. We’ve been so busy with other things that I ran out of steam. Instead we decided to go with this gorgeous textured wallpaper. 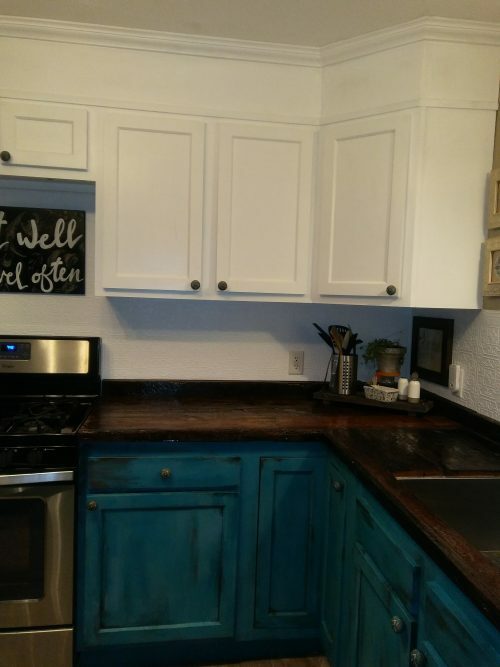 I was able to get it all up in one Saturday afternoon and by Sunday night had 2 coats of cabinet paint on it to help protect it and exactly match it to the upper cabinets. The wall art includes the exact recipe pages from the betty crocker cookbook my parents used as we were growing up. I love seeing the stains on the pages. The sale and pepper shakers will be replaced eventually but they were my mom’s and since she’s passed away I am fully savoring everything I have and use that brings me memories of time with her. The plant is a mint plant, it’s the best. After some time in Europe a few years back I just loved how tea would arrive with springs of fresh mint leaves in it. Since then I’ve had this plant and we cut off a few inches of stems and add them to hot water for tea. Right now I’ve placed that plant on a mason jar but I’ll be keeping my eye out for a rustic piece to hold it. In the seam above where the two counter pieces meet up I was able to fill with clear silicone then epoxy as well to level it out. 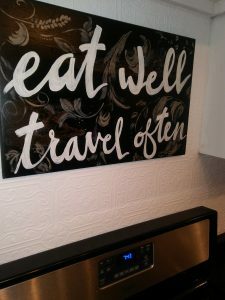 The sign below is painted on a repurposed cabinet door from my dad’s old kitchen. I love that it still has a few holes in it where the knobs were. The knobs we got from Hobby Lobby, they are wood with metal. I absolutely love the old world, European feeling they have. 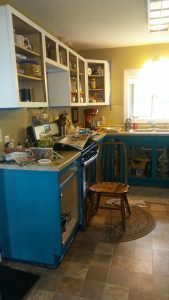 Here you can see the raised cabinets, the wallpapered backsplash, the new countertops and how they are all pulled together with the rustic paint on the cabinets and decor. We also replace the composite sink with this large, undermount, stainless steel, single basin sink. I ABSOLUTELY love how it’s all come together. The counters are super durable, easy to clean and yet imperfect so I don’t worry about them much. 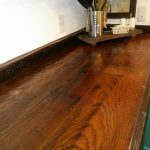 This coffee bar was one of the first projects we did in this house. 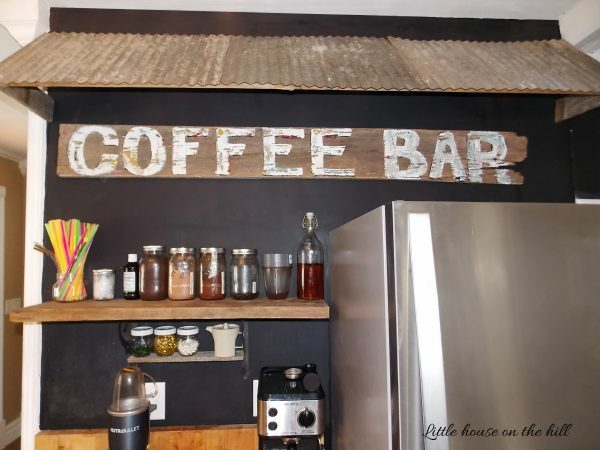 It has a black chalkboard painted wall, I’ve painted the coffee bar sign on an old piece of repurposed wood. The corrugated tin awning was actually from panels we found buried in our yard after we moved here. 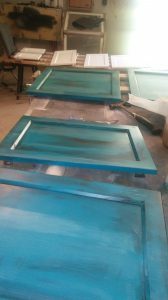 We found a good dozen or more of these large panels so we’ve had fun integrating them into projects around the house and yard. The butcher block was there when we moved in. We both actually make either espresso, coffee or iced coffee pretty much every day so we love having a bar full of espresso beans, coffee, cocoa, stevia, coconut oil, caramel syrup, sweeteners, a mixture of metal reusable straws and regular straws and then some of Bruce’s vitamins on the little shelf tucked under the larger shelf. 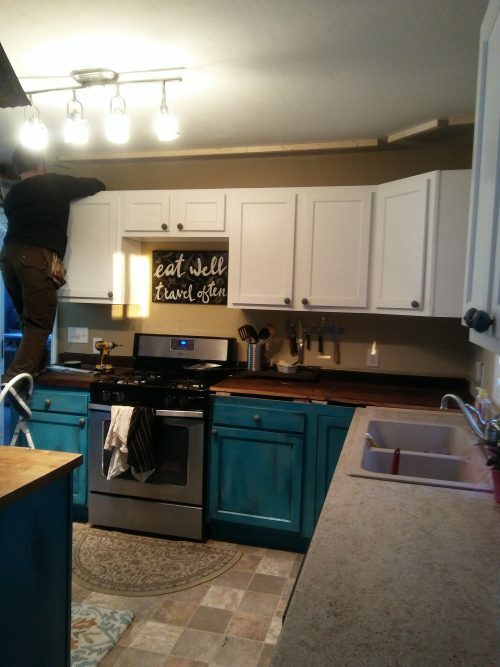 Thank you so much for following along on this kitchen makeover with us!! I also have some videos of the process that we’ll be adding to our new Little House on the Hill youtube channel.